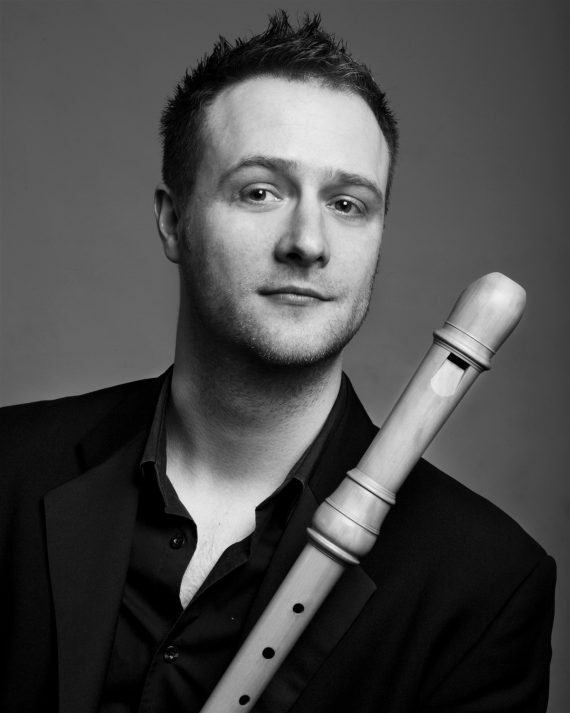 Chris Orton is active as a recorder player, teacher and conductor throughout the UK and Europe. Since graduating from Birmingham Conservatoire in 2004, and after further studies with the recorder player Anneke Boeke in Amsterdam, he has developed a portfolio career in performance and music education – dedicating equal amounts of commitment to both. He currently holds teaching positions at the Royal Northern College of Music, Chetham’s School of Music, Birmingham Conservatoire, Junior RNCM, the National Youth Recorder Orchestra and the Stockport Youth Orchestra, and conducts the Junior RNCM Wind Ensemble. He also teaches Dalcroze Eurhythmics at the Escola de Musica Joan Llongueres in Barcelona. Chris taught for ten years for Manchester Music Service providing ‘first access’ and music and movement classes in inner city primary schools, and conducted the Birmingham Schools’ Recorder Sinfonia for Birmingham Music Service. In recorder performance, Chris enjoys the whole range of repertoire; in particular, he has performed a considerable amount of 20th and 21st century music for recorder, often with live electronics or with other instrumentalists. He has been active commissioning new music, and in particular introducing the recorder to student and professional composers at conservatoires throughout Europe. such projects have taken place at the RNCM, University of York, Krakow Academy of Music and L’Escola Superior de Musica de Catalunya in Barcelona. Chris has also performed solo recitals at notable contemporary music festivals in Amsterdam, Krakow and Huddersfield. Recently Chris has started incorporating newer designs of recorders in his concerts, and uses both the Maarten Helder tenor and ‘modern’ altos made by Tarasov/Mollenhauer. Early on in his career Chris was successful on the international competition circuit. Highlights include winning the 1st prize at the Moeck/SRP International Solo Recorder Competition in 2007, a £20,000 BBC Performing Arts Fund Bursary (2007), 2nd Prize, ‘Prix du Jury’ and Gaudeamus Prize at the International Competition of Contemporary Music ‘Krzysztof Penderecki’ (2006), and the Silver Medal of the Worshipful Company of Musicians (2004). Also in 2004, Chris was the first recorder player to win the Symphony Hall Recital Competition, and thus gave the first solo recorder recital in Symphony Hall. As a student, Chris was the first ever recipient of the Biddy Baxter and John Hosier Music Trust award, in 2003. Chris believes one of the best ways to remain relevant as a teacher and performer is to continue learning, formally and informally. Recently Chris has undertaken formal study of Dalcroze Eurythmics and passed all practical and written examinations for the Certificate qualification of Dalcroze UK. Since 2014 he has been studying conducting at Escola Superior de Musica de Catalunya in Barcelona with Jordi Mora. All these different strands of music making and learning enhance each other, and all enhance his passion for teaching and helping others explore the musical world.